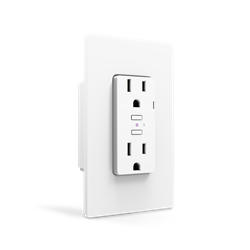 The iDevices Wall Outlet is perfect for retrofit or new home automation. It installs in a standard gang box and offers two individually controlled outlets. The iDevices Receptacle uses WiFi and Bluetooth communication. Control, check status, and set schedules with your iOs or Android device using the free iDevices app. The iDevices Receptacle is HomeKit compatible with support for Siri voice control. It also works with Amazon Alexa and Google Home. If you're on the road, no problem. As long as your home has an Internet connection you can remotely check status and control your home with iDevices. The free iOs and Android apps let you easily set device names, create lighting scenes, and group devices in to rooms for easy control. Plus as a bonus you get energy reporting to let you know how much electricity your connected products are using. As a bonus, the built-in LED indicator can be adjusted to your preferred colour and brightness and can even be scheduled. Note: Trim plate is not included. Uses standard decorator plates or screwless plates.